Drink at least 1.5 – 2 litres of fresh filtered water daily. Dehydration is one of the biggest causes of fatigue, mood changes and over-eating. Often when we think we need a sugar hit mid-afternoon, it’s our body telling us we are dehydrated. Add fresh lemon, lime or mint leaves if you need to spruce up the flavour. Eat leafy greens and a broad range of colourful vegetables each day to ensure you are consuming a broad range of nutrients and phytochemicals. Recent research has shown that a diet high in vegetables is not only linked with better physical health, it is also correlated with a positive mood and better mental health2. Consume good quality protein at every meal to help with blood glucose regulation, energy, mood stabilisation and weight management. 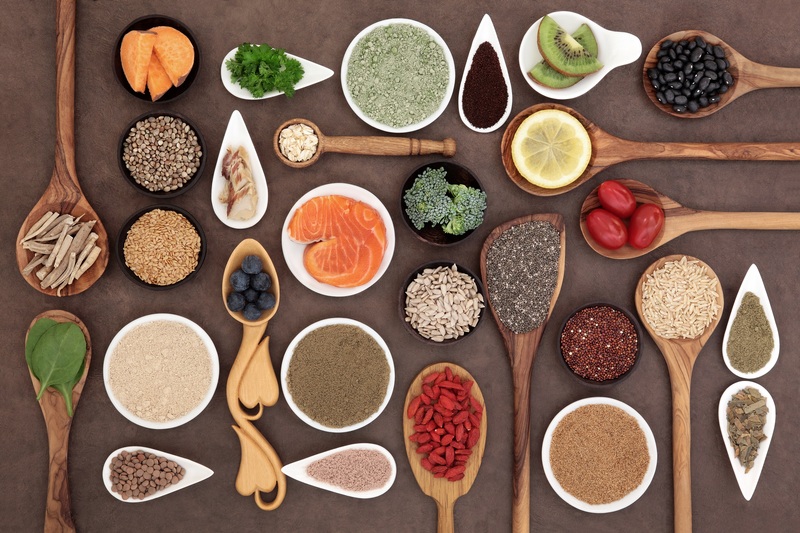 Good quality protein includes eggs, fish, chicken, legumes, pulses, seeds, nuts and meat; so whether you are a meat-eater, vegetarian or vegan, there are plenty of good quality protein options to add to your meals. Remove dietary irritants such as processed foods, refined sugars and gluten as they can trigger an inflammation reaction causing weight gain, low energy, digestive symptoms and affect mood. Suss out local cafes with healthy options around your work and home. If you are at work and haven’t brought in lunch, it’s good to know where you can quickly pop out to grab a healthier option, rather than simply reaching for a sandwich each time. Some of my favourite quick eat options are a roast vegetable frittata, a salmon salad or a non-dairy super smoothie (cafes such as THR1VE are a great option for smoothies). Planning & preparation – often the key to a healthy diet is simply planning your meals and snacks in advance! If you have vegetable sticks and hoummus in your cupboard at home and you are hungry, you will most likely reach for this, rather than drive to get something unhealthy. If you are not a morning person and leave early for work in the morning, try making a healthy smoothie the night before and store in a glass jar in the fridge ready to grab in the morning for a healthy breakfast on the go. Cupboard cleanse – if your cupboards contain junk food or foods you are trying to avoid – give it away! Even someone with the strongest will-power will find it hard to resist foods if they are right in front of them every-day. Invest in a high-speed blender – my blender is one of my favourite kitchen appliances. It allows me to whip up healthy green smoothies in under a minute, make raw-food desserts and create delicious sauces and dressings. Luckily there are a range of high-speed blenders available now from $129 for a Nutribullet, $475 for an Optimum 9400 (my pick) or a top of the range Vitamix or Thermomix. To celebrate National Nutrition Week and learn more about which foods suit your body best, book in for a complementary mini health assessment in October. Simply contact reception on 9939 8817 to book your appointment today!